On 11 September 2013, Catalonia’s national day, approximately 1,600,000 Catalans joined hands along Catalonia’s coastline to form “The Catalan Way towards Independence” a 400-kilometre (250-mile) human chain. The Catalan Way was inspired in the 1989 Baltic Way chain that called for the independence of Estonia, Latvia and Lithuania during the breakup of the Soviet Union. Likewise, the Catalan Way aimed at being a massive tour de force to push for a referendum on secession from Spain, something that the government in Madrid fiercely opposes. Everyone in Catalonia knew that, much like contemporary revolutions, the 400 kilometre human chain would be tweeted. 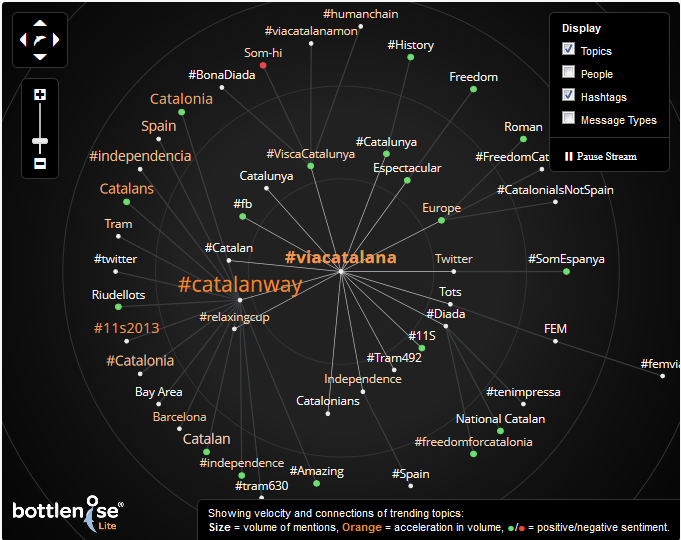 Hashtags such as #CatalanWay or #ViaCatalana had already been popular during the previous days and were profusely used as hundreds of thousands were starting to gather along the pre-assigned line stretches to join hands. And yet, no trace of these topics could be found in Barcelona’s trending list. 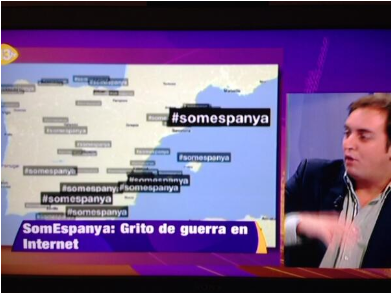 In parallel, pro-unionist TV channels in Madrid were boosting their own ranks by proudly showing how the hashtag #somespanya (“wearespain”) reigned supreme in Barcelona as the Catalan Way unfolded. Accusations of Twitter having censored trends or content have been made in the past, but Twitter Rules clearly establish that the service “will not censor user content, except in limited circumstances”. These circumstances are essentially abuse (i.e. serial or bulk accounts, targeted abuse, username squatting, etc.) and spam conducts, and Twitter reserves the right to suspend or terminate accounts without further notice if such practices are detected. So why are trends not trending? Blame the algorithm instead of the policy. As Twitter puts it, “this algorithm identifies topics that are immediately popular, rather than topics that have been popular for a while or on a daily basis”. When it comes to real-time information, Twitter is sometimes as fast as wind and can sense an earthquake even before people can feel it, so its algorithm is more sensitive to sudden “text events” than to ongoing updates. As Ross Wilson writes, “it only really has time to process the raw data – tweet content, time posted, and topic hashtag. This means a lot less customization of search results is possible, and with no human curation to aid the trended topics list, the topics that make it to the list might not always be the topics readers are genuinely interested in.” A good seismograph, but not necessarily a reliable responder (and this should be taken into account when monitoring Twitter hashtags for disaster management). What else can people do? They can think ahead and consider using alternative hashtags that have not yet received Twitter baptism. But carefully designed hashtags can go terribly wrong, in politics as in marketing, as the Spanish Popular Party or the McDonald’s Twitter campaigns have proved. Another possibility is spontaneous creativity. In Catalonia, as the human chain started to dissolve in the evening and people hang out for some light dinner, a local radio presenter humorously suggested to test the algorithm by using #croquetes (croquettes) instead of #ViaCatalana when posting updates on the event. 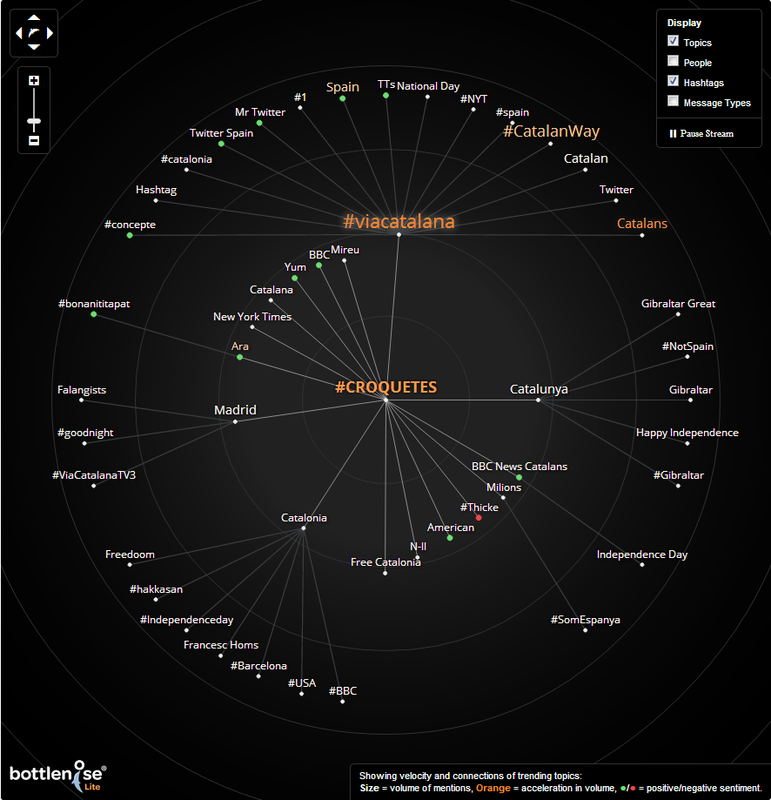 The idea went immediately viral and #croquetes became a global trending topic. 1.600.000 #croquetes can't be wrong. So perhaps the lesson for political activists would be: Unless Twitter decides to tweak its algorithm, don’t cook your croquettes too early or you will have to swallow a much less yummy appetizer later on. 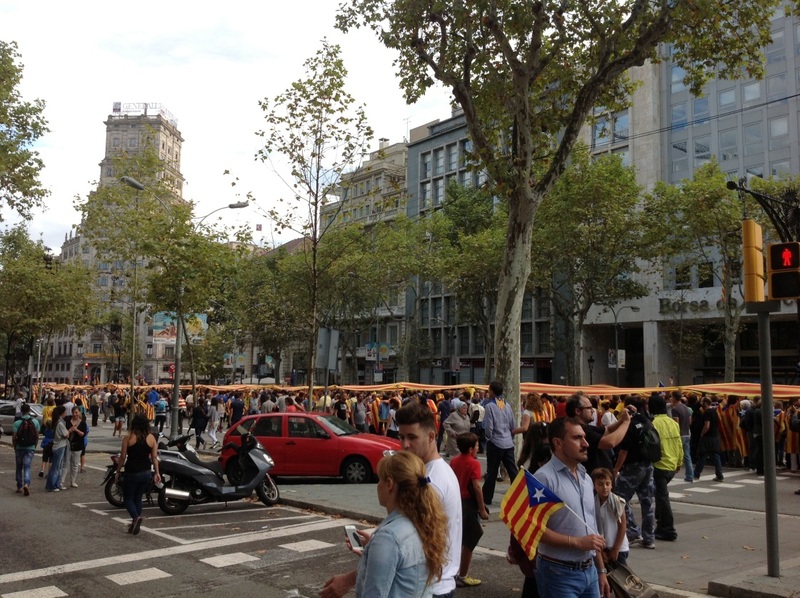 This entry was posted in Politics, social media and tagged Catalan way, Catalonia, independence. Bookmark the permalink.